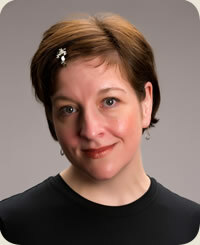 Mary Scott Huff is a designer, author, blogger and nationally-recognized teacher. Her dynamic style and lighthearted approach have resulted in a cult-like following among her students. Once you've taken a class with Mary, you'll want to come back for more. Part technical expert, part witty raconteur, part compulsive string lover, Mary understands all the reasons why we love knitting. You'll see, touch and try on the knitting in Mary's trunk show, and gain a first-hand understanding of her processes and inspirations. What better place to let loose and enjoy your favorite hobby than on a cruise? The relaxed atmosphere and enhanced accessibility of your teachers combine to create a uniquely special knitting experience for you, and the new friends you'll make in Mary's class. Mary's mother, a theatrical costume designer, taught her to sew as soon as she could keep hold of a needle. Knitting was a recreational sideline for them both, from the beginning. After costuming came tailoring, millinery and couture dressmaking. Mary put herself through college by sewing for the opera, ballet, theatre, and making wedding gowns. After securing her theatre degree, Mary decided the life of a starving actor in New York wasn't for her, and headed back home to the Pacific Northwest. With no skills other than sewing and acting to her name, she somehow landed a job in the telecommunications industry. She just acted like a computer programmer. And 20 years passed. While the living she earned from Information Technology was great, Mary never quite understood those people. She longed to return to a creative life. Seized by tactile, rather than food cravings early in her first pregnancy, Mary picked up her knitting again when the urge to touch wool presented itself. The cravings have never subsided. Mary extricated herself from the computer world in 2010, in order to pursue a more yarn- centered existence.